The tough, flexible and thin film allows you to retain the natural texture and beauty of wood. Ideal for Garden Buildings or for freshening up old wood stained surfaces. Has a satin finish. 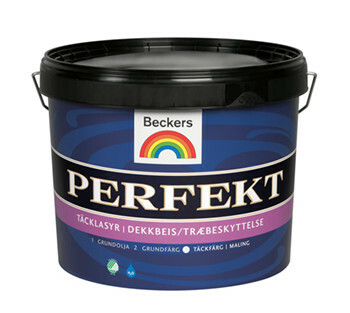 Beckers Perfekt Täcklasyr 1L is a premium product and the ideal choice for painting large areas of exterior wood and joinery. The paint has a slight sheen, is very easy to apply and has good penetration and adhesion. It will give you long lasting protection against water absorption, colour fading and chalking. Use it to paint your new garden building or summer house. Its also great to paint over previously stained surfaces. Because of the flexible thin film you can change the colour of your garden building without losing wood’s natural beauty. What are you waiting for? emphasizes the beautiful nature of wood. Wash dirty surfaces. Treat mould and algae with Becker’s Alg & Mögelmedel. Scrape or brush away loose paint and grey, porous wood. Remove completely thick and cracked paint layers. Round off sharp corners and edges. Lightly sand planed or pre-finished surfaces. This helps to key subsequent layers. Then brush away all dirt and dust. Oil new and sanded surfaces with Perfekt Impregnation Oil. Wipe away any excess oil. The surface can then be painted after 30 minutes but before 3 days have expired. Previously painted surfaces in good condition do not need oiling and surfaces in poor condition should be primed with Perfekt Tragrund. Finish with two coats of Beckers Perfekt Täcklasyr. IMPORTANT NOTES! When spraying, use a filtering half mask against solid and liquid particles (FFP2). If necessary, stir the paint before use. The surface must be dry when painting, max 16% moisture ratio. Do not spread the paint too thinly, but apply the correct amount as recommended. Do not paint on sun-baked surfaces. Also, do not paint if there is a risk of rain or dew within 1-2 hours after painting. Very high humidity increases the drying time. Do not dispose of excess paint down the drain but according to local authority rules. Live Chat : On website, see 'Chat with us' button. In-store : Unit 11 Hellesdon Park Road, Drayton High Road, Norwich NR6 5DR.